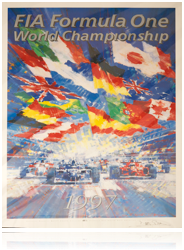 Size 64cm x 90cm In 1997, Bernie Ecclestone tried to revive the custom of the early motor racing years by issuing a set of posters for each Formula One Grand Prix race and one generic poster covering all races. 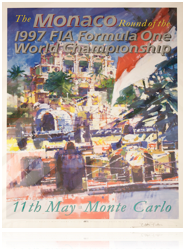 He commissioned Dexter to paint the artwork for the posters. 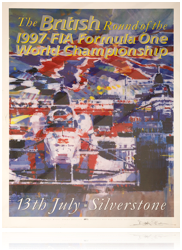 These posters made it to print but distribution was severely limited as after the first race there was a poor response to them and they were withdrawn from further distribution. God knows why, they are stunning and a real piece of motor racing history. These posters are very rare to find, the ones here are signed by Dexter.